This morning on one of the news channels they were talking Valentines Day. Oh how that word resonates differently between the male & female mind. I got a good chuckle out of some of the men that were being interviewed, and their thoughts on this big day. One of the guys was really funny and it made me laugh out loud! Cheesecake and Valentines Day go together. I’m not a lover of Real Cheesecake . . . I know it’s weird! I will eat it, but I feel my calories could be spent better. My sweet daughter Brandi makes this scrumptious dessert and I snagged the recipe from her. It’s my kind of Cheesecake . . . light, fluffy and any topping or berry under the sun would be perfect. I wanted to take a picture before it was totally dark outside. The Cheesecake hadn’t been in the fridge very long . . . so I left the little trays on the bottom for now. You can’t really tell from the picture, but these little Cheesecakes are actually hearts! We don’t really do anything fancy schmancy for Valentines Day . If we do anything at all, we might go out to dinner. I don’t need roses or fine jewelry . . . in fact, I’d rather just go buy a new pair of jeans or new shoes! Raspberry & White Chocolate versus Lemon Curd & Coconut Cheesecake. If you don’t have a spring form or tart pans, never fear. You can simply use a cupcake pan, and use paper liners. They will look similar to this. As for what to get my sweet husband . . . Well anyone that knows him, also knows he is difficult to buy for. He isn’t picky. If he doesn’t feel he needs it . . . he doesn’t want you to buy it! If you read this blog, then you already know he isn’t a lover of sweets. Every Valentines Day, I try to make his favorite meal and every year he is pleasantly pleased. Chicken and Homemade Noodle Soup is actually my four daughters favorite meal as well. Click here to see one of my favorites. I found these heart shaped spring form pans at . . . Target of course! My little cheesecakes start out with a Graham Cracker crust . . . Oreo or Chocolate crumbs would also be yummy. Put a generous 1/4″ of crumbs on the bottom. I always tend to go a little overboard with the crumbs. I baked my graham cracker crust in a 350 degree oven for about 8 minutes. I also used a couple of little Tart pans with removable bottoms. 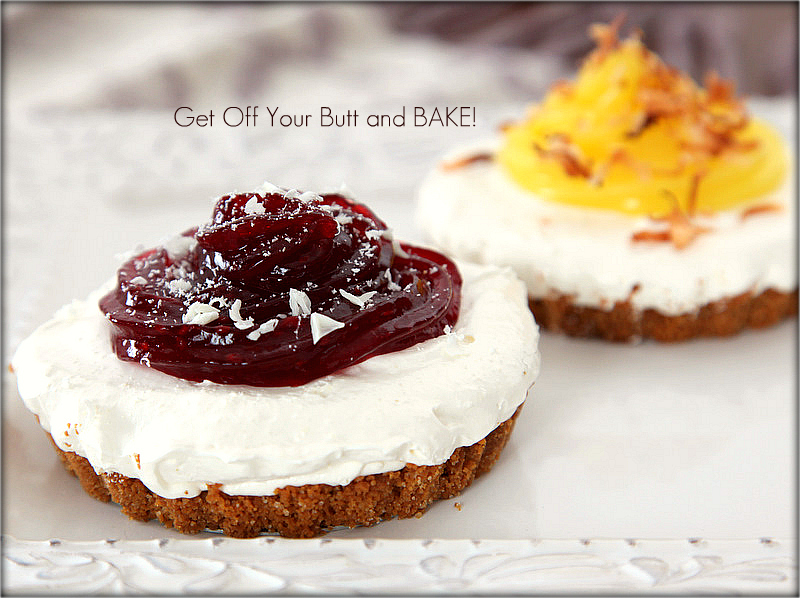 This will be the easiest No Bake Cheesecake you will ever make. Cream cheese, Powdered Sugar, Pure Vanilla, White Sugar & Cool Whip. If you don’t care for Cool Whip, you can use a pint of Whipped Whipping Cream instead. If you’re making this ahead time and don’t plan to serve it right away . . use Cool Whip. Madagascar Bourbon Vanilla flavored my Cheesecake. Side note: Let’s talk Vanilla! I’ve buyed into all the hype surrounding Italian, Madagascar and a myriad of other Vanilla’s. Maybe I could tell the difference if I conducted a side by side test and used Pure Vanilla Extract in some, and these other expensive varieties in the others. However . . . I really can’t tell that much difference in taste quality. Just make sure you use Pure Vanilla Extract instead of imitation, and your cheesecake will be divine. Beat the Cream Cheese, Sugars & Vanilla together until mixture is creamy and smooth. Now blend in the Cool Whip until mixture is thick and Fluffy. Divide the Cheesecake mixture evenly between pans, and spread over the cooled graham cracker crust. You can also use a 9×13 baking dish, or a cookie sheet. At this point, you could also spread the pie filling of your choice over the cream and then chill. I didn’t leave much head room for berries, so I put it on afterwards. Once it’s set up, plop those little babies out of their shells! 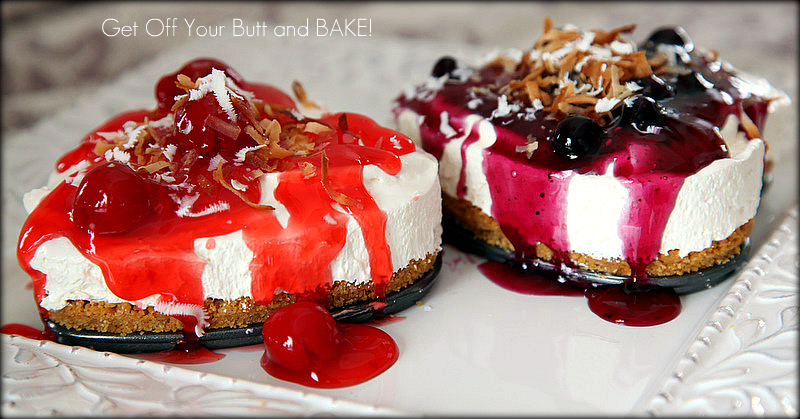 Note: You could flavor the cheesecake with different oils: Coconut, Key Lime, Pomegranate, etc. Drizzle Hot Fudge over the top, or top with fresh Strawberries, Raspberries, Blueberries, kiwi, etc. note: Cool Whip comes in small or large containers. I used 3/4 of a large one. Mix crumbs, melted butter and sugar together in bowl. Press crumb mixture firmly onto bottom of greased baking dish or desired pans. Bake at 350 degrees for 6 to 8 minutes or until lightly browned. Let Cool before adding Cheesecake mixture. Beat the cream cheese until light & fluffy. Add the powdered sugar, white sugar and vanilla and beat until very smooth. Add the cool Whip and beat again until mixture is thick and smooth. Spread over the top of cooled Graham Cracker crust or chocolate crumb crust. Top with cherry, blueberry, lemon curd, raspberry filling, etc. Place in refrigerator and chill for at least 2 to 3 hours before serving. Garnish with Toasted Coconut and White or Dark chocolate shavings. “I don’t need roses or fine jewelry . . . in fact, I’d rather just go buy a new pair of jeans or new shoes!” LOL!!! I am SO with you on that one. However, cheesecake is my absolute favorite! I can’t stop at one bite. I love the Cherries on top of mine, and I think adds a tartness to the taste. You could of course leave out the additional sugar. I always post the original recipe, but it’s always adaptable to other tastes as well. Hi! I’ve never made cheesecake. I wanted to be clear, that’s 1 cup powdered sugar AND 1/4 granulated sugar for the filling? Yes, after beating the cream cheese until light & fluffy, add the powdered sugar & granulated sugar and beat again until smooth. Beat in the cool whip.